Thanks to the folks at Ducks Unlimited Canada (DUC) and the Dalhousie Biology graduate students for the invite to talk about the social aspects of salt marsh restoration yesterday at Dalhousie’s LSC. DUC’s Lee Millett led the way with a scientific backgrounder, and then I summarized a few studies of mine that help us understand the public (and thus) responses to salt marsh restoration. Nick Hill concluded with some preliminary analyses of restoration projects underway with DUC in the Jijuktu’kwejk (Cornwallis) river. A fun way to spend a Friday afternoon. St. Andrews Marsh, May 21, 2018. Make recommendations to the Minister on emerging and evolving biodiversity issues. The Council’s work will include supporting the development of a Biodiversity Act, a project under the strategic priority “Our Natural Resources.” The purpose of the Act is to further enable Nova Scotia to improve the conservation and sustainable use of wild species and ecosystems in flexible and adaptive ways, address legislative gaps and manage emerging risks. I’ve been working with DNR folks like Glen Parsons and John Brazner for years on social science about biodiversity conservation on farms, coasts and wetlands, and will be pleased to be of service. A subset of Thaddeus Holownia’s series of a small wetland near his home. In between storms, my family and I got out on the weekend for some wetland adventures. The Shubenacadie Wildlife Park is always popular with our small ones, though the wind chill sped it up more than usual. It was great to see the new(ish) developments and interpretations that connect the park more closely with the Greenwing Wetland Centre. They had snowshoes available to borrow, and we all gave them a go, though the smallest member of the family struggled at their size. In the afternoon, after a warm-up, came a visit to the Art Gallery of Nova Scotia, for their excellent show of Thaddeus Holownia‘s photography. Holownia is based around the Tantramar marsh, and while his photographs vary more widely in their geography, it was the local stuff I loved most. For instance, particularly intimate and moving was the above longitudinal series of photographs of a little manmade pond on his property near Jolicure, NB, over time and in different conditions. It was also wonderful to see his series on the erstwhile Radio Canada International shortwave towers near Sackville, NB, a missed landmark for me. My cellphone reproductions do not do the work justice: AGNS says on their website that there is an “attendant publication” for this show, but it was not available in the shop. Hopefully soon. The faint sketches of the shortwave radio towers of Radio Canada International, captured by Thaddeus Holownia before their removal in the early 2010s. 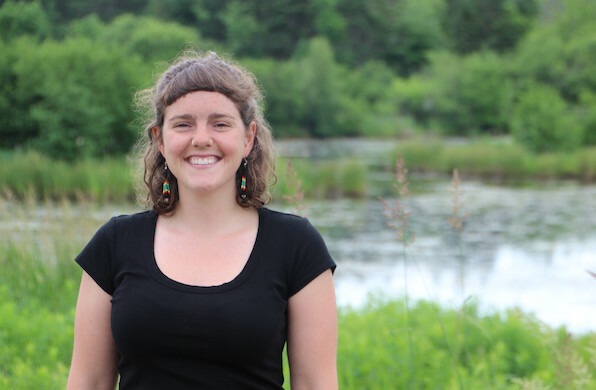 Mhari Lamarque, Dalhousie MREM candidate, working for DUC at the Greenwing Centre at Shubenacadie, NS. SRES is a frequent flier with Mitacs, an NGO that links students who need experience with companies who need research. Our MREM and MES students often partner with Mitacs to match funds to support their internships and theses. We are thrilled now that Mitacs will also partner with environmental NGOs like Ducks Unlimited Canada (DUC). DalNews published a nice article today about one such intern, Mhari Lamarque, who will be entering the final term of her MREM in the fall. She is working with me this summer, conducting research and developing program evaluation advice for DUC as her internship. The organization is looking to understand the value of their youth education programs and target new supporter groups without abandoning their traditional ones. Conservation organizations are often staffed by biologists rather than social scientists, so it’s a great opportunity to partner. The project winds up next week, and – as does any good research – seems to suggest as many new research questions as wrap up old ones. Really pleased to see the paper from Simon Greenland-Smith’s MES on farmer perceptions of their farm ponds and wetlands out in the June 2016 issue of Ecological Economics. Simon did walkabout interviews with farmers around their wetlands and ponds, and coded the results using the ecosystem goods and services (EGS) framework popularized by the Millennium Ecosystem Assessment. He used novel approaches to ‘standardize’ farmer expression styles, and used the results to counter the results from economic valuations of wetlands from TEEB data (see above). Simon’s thesis was funded by my 2012 SSHRC Insight Development Grant on farmer stewardship of EGS in the face of climate change. He continues on in the lab leading our extension work on farm biodiversity, including managing BioLOG.